Heat oven to 350°F. Spray two 2 3/4x1 1/4-inch muffin cups with cooking spray. In small bowl, stir together cream cheese, 1 teaspoon granulated sugar and the almond extract. In shallow dish, place 1 tablespoon granulated sugar. Place biscuits on microwavable paper towel. Microwave on Medium (50%) 30 to 40 seconds, turning over halfway through microwave time. (Biscuits will be almost thawed.) Press each side of biscuits into granulated sugar, flattening biscuits. Press each biscuit into bottom and up side of muffin cup. Spoon cream cheese mixture evenly into biscuit cups. Top with preserves. Bake 17 to 25 minutes or until edges are light golden brown. Cool 5 minutes. Gently remove from cups. In small bowl, stir together powdered sugar and water. Drizzle over biscuits. Serve warm or cool. 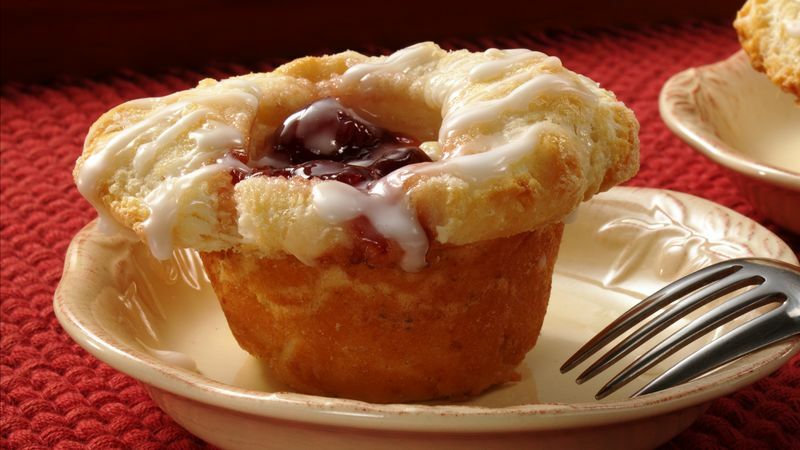 Use different flavors of preserves, such as strawberry, blueberry or peach, to make a variety of pastries.